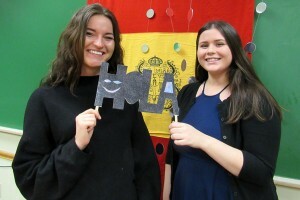 Sigma Delta Pi, founded in 1919 at the University of California, Berkeley, is the only national honor society recognizing outstanding college and university students of Spanish. 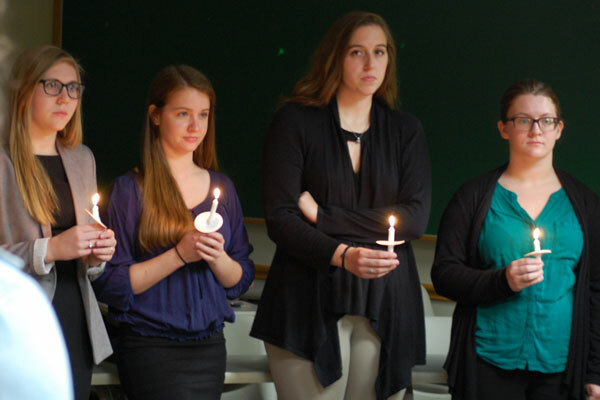 The Ohio University chapter, Phi Rho, was founded in 1986 and has inducted more than 450 members. 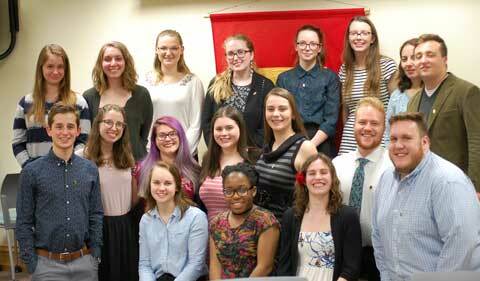 Certification from the Association of College Honor Societies attests to Sigma Delta Pi’s legitimacy and renown, and more than 590 active chapters promote and reward the study of Spanish in US colleges and universities. The society is affiliated with the American Association of Teachers of Spanish and Portuguese (AATSP); the North American Academy of the Spanish Language (ANLE); the Instituto Internacional Sampere in Spain and Ecuador; UNINTER of Cuernavaca, Mexico, the Academia Latinoamericana de Español in Ecuador; and the Instituto Franklin-Universidad de Alcalá de Henares in Spain. The society awards various scholarships, prizes, and grants to members each year. 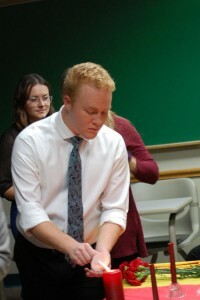 Ohio University’s chapter of Sigma Delta Pi hosts events every semester. Members are required to attend two events per semester, organized by the Department of Modern Languages, Latin American Studies, or any other club or organization relating to Spanish language or culture. Sigma Delta Pi is now accepting applications for Sigma Delta Pi. The online application must be completed by Friday, September 21, 2018. Please be sure to read about the fees and initiation ceremony before you apply! 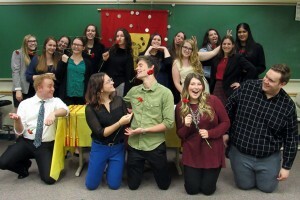 Sigma Delta Pi Receives Two Awards! 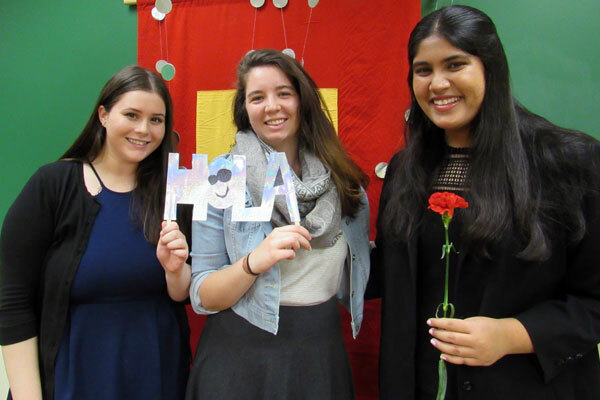 The department chapter of Sigma Delta Pi, National Collegiate Hispanic Honor Society, was named one of the National Society’s Honor Chapters for 2017-18. Of the 600+ chapters nationwide, only nine chapters were selected this year. 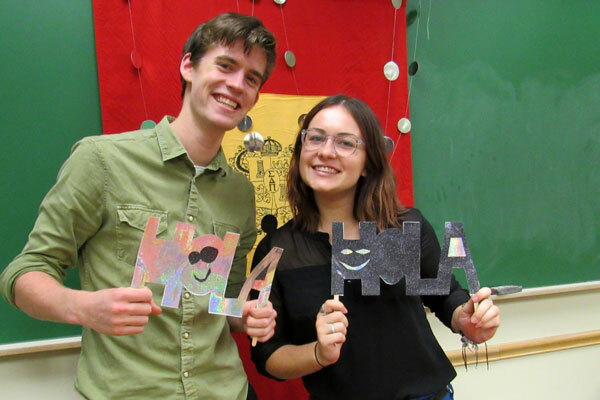 According to the National Society’s website: “Honor Chapters (Capítulos de Honor y Mérito) are selected each year by the Executive Committee based upon annual reports submitted by the chapters. 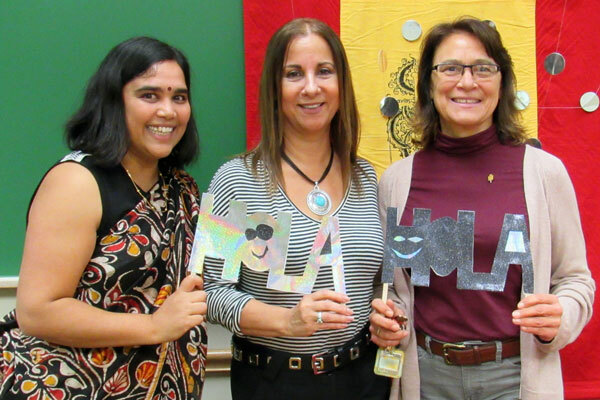 Awardees are those chapters that have distinguished themselves during the academic year with activities and projects that best reflect the mission of the Society.” Our department’s chapter also won a second award for 2017-18, the Phoenix Award. This award “recognizes one chapter for a year of extraordinary and exemplary activity as compared to the previous year(s).” The department is extremely proud of these awards, and we wish to extend our congratulations to the members of Sigma Delta Pi, to our Spanish faculty, and especially to Dr. Ganeshan, our chapter advisor. 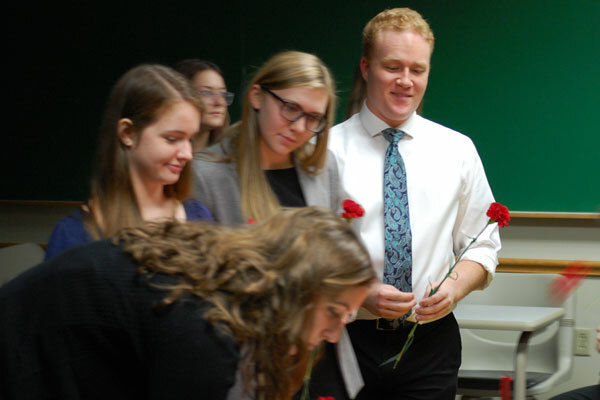 Congratulations to Ohio University’s chapter of Sigma Delta Pi! 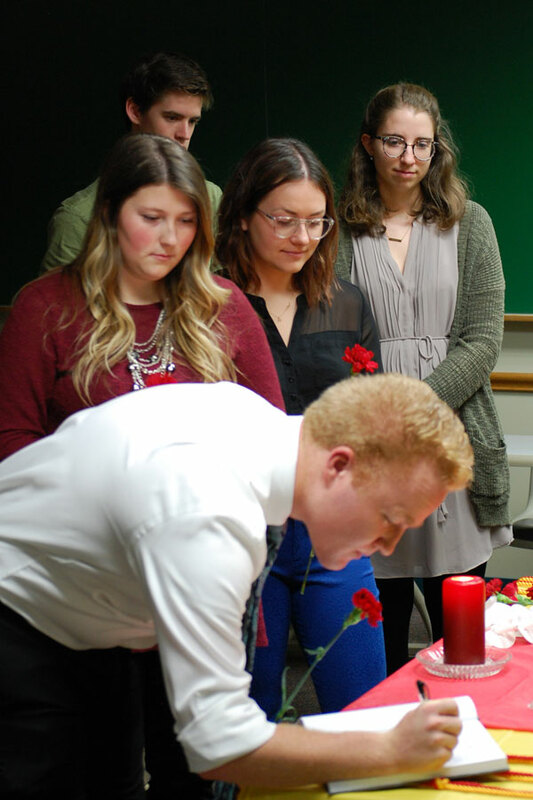 Congratulations to the new initiates of Sigma Delta Pi: Alexis Broomes, Alexis Wales, Genoveva Di Maggio, Olivia Sturtevant, Patrick Ballow, Rachel Broughton, Spencer Cappelli, Suzy Aftabizadeh, and Taryn Osborne! ¡Felicidades! The Ohio University Chapter Pi Rho/Tao of Sigma Delta Pi, the National Collegiate Hispanic Honor Society, held it’s initiation ceremony on March 6th, 2018 in Gordy Hall. 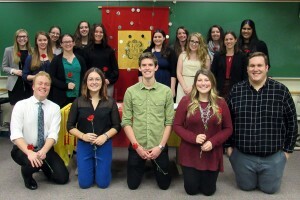 Sigma Delta Pi is the only national honor society recognizing outstanding college and university students of Spanish and requires members to hold a high GPA in Spanish and overall. 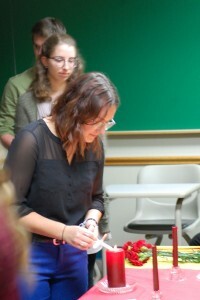 Twelve new members were selected for membership to the Society. This great honor is celebrated at the initiation ceremony. 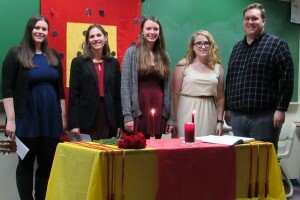 The ceremony, conducted in Spanish, was organized and led by the officers of Sigma Delta Pi and included readings of a poem by Mexican poet Sor Juana Inés de la Cruz. 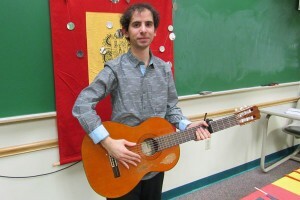 Jesús Sánchez, a flamenco guitarist, rendered a beautiful performance at the ceremony. Following the ceremony, at the reception, new initiates, officers, members, the advisor, and the chair of the Department of Modern Languages interacted with each other. Congratulations new Sigma Delta Pi members on your initiation, Wednesday, November 15. Please fill out the online application form by Friday, February 16, 2018. 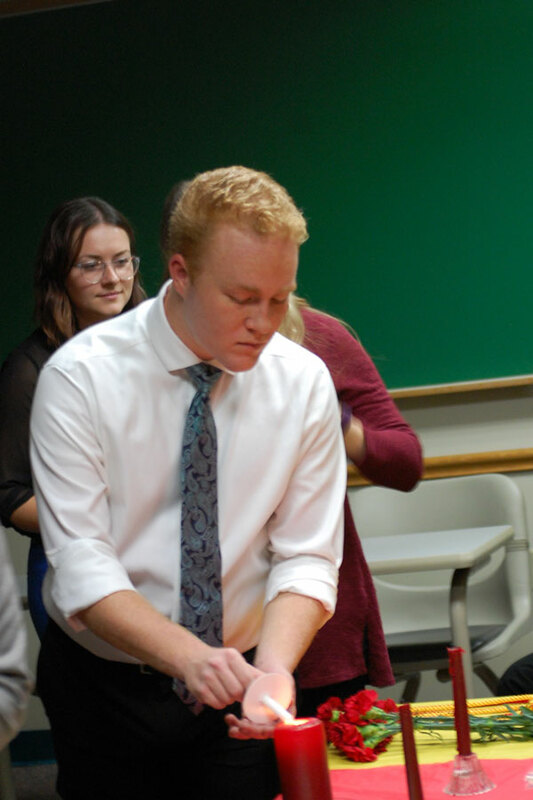 Once you are accepted, you must pay a one-time membership fee of $30 and attend the Initiation on March 6, 2018, from 6:15pm – 8:00pm in Gordy 113. 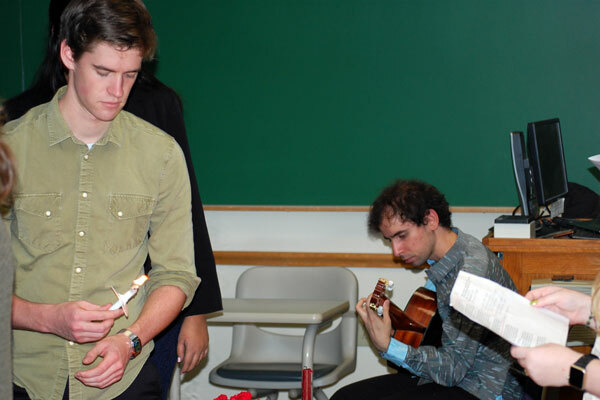 In order to be an active member, members are requried to attend at least 3 SDP events each semester. 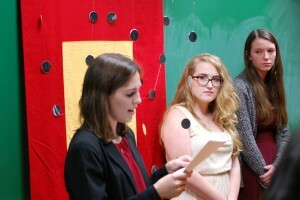 SDP meetings do not count as an event. Only active members can contest in the elections.